UN Watch and Human Rights Foundation brought famous dissidents to testify before a UN luncheon briefing yesterday. 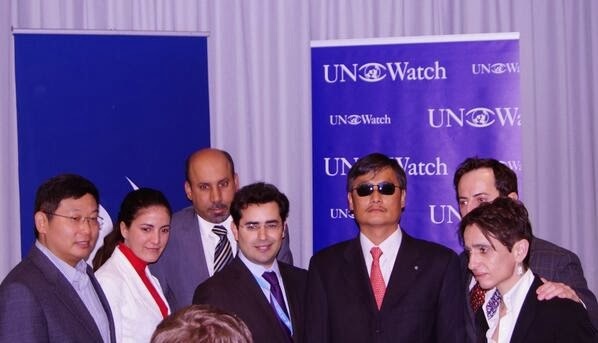 Left to right: Chinese dissident Yang Jianli, Cuban dissident Rosa Maria Paya, Saudi dissident Ali Al-Ahmed, UN Watch executive director Hillel Neuer, Chinese dissident Chen Guangcheng, HRF president Thor Halvorssen, and Russian dissident Masha Gessen. GENEVA, November 5, 2013 - As the U.N. prepares to elect 14 nations next week to its highest human rights body, a coalition of non-governmental human rights groups and MPs sent an appeal yesterday to U.S. Ambassador Samantha Power and EU foreign affairs commissioner Catherine Ashton urging them to oppose the candidacies of China, Cuba, Russia, Saudi Arabia, Algeria, Jordan, and Vietnam. The regimes were found to be "Not Qualified" under the U.N.'s own membership criteria, in a report presented yesterday at a UN briefing in New York before media, diplomats and human rights activists. The qualifications of Maldives, Morocco, Namibia, South Africa, South Sudan, Uruguay were deemed "questionable" based on problematic human right records or UN voting records. Click here for PDF of the full report. The evaluations were published by two non-governmental organizations, the Geneva-based UN Watch and Human Rights Foundation. "China, Cuba, Russia, and Saudi Arabia systematically violate the human rights of their own citizens," said UN Watch executive director Hillel Neuer, "and they consistently vote the wrong way on UN initiatives to protect the human rights of others." "For the UN to elect Saudi Arabia as a world judge on human rights would be like a town fire department choosing a pyromaniac to be its chief firefighter." With the release of the report, an international coalition of NGOs and MPs appealed to the U.S. and the EU to take action. Regrettably, so far neither the U.S. nor the EU have said a word about hypocritical candidacies that will undermine the credibility and effectiveness of the UN human rights system. By turning a blind eye as human rights violators easily join and subvert the council, leading democracies will be complicit in the world body's moral decline. It will be an insult to their political prisoners and many other victims -- and a defeat for the global cause of human rights -- if the UN helps gross abusers act as champions and global judges of human rights. When the U.N.'s highest human rights body becomes a case of the foxes guarding the hen house, the world's victims suffer. Yang Jianli, a Chinese scholar, pro-democracy advocate, and former political prisoner, who presented a petition against China’s bid for a seat on the UNHRC. Human Rights Foundation president Thor Halvorssen and UN Watch executive director Hillel Neuer jointly presented their report evaluating the countries that have submitted candidacies for the November 12 election of new members to the UNHRC. Click here for PDF of the full report. The Kennedy assassinations: Cui Bono?